Originally from Belgium, Dr. Verdin earned his MD from the University of Liege, in Belgium. He trained at Harvard Medical School and has held faculty positions at the University of Brussels in Belgium, the NIH in Maryland, and the Picower Institute for Medical Research in New York. Dr. Verdin studies the molecular virology of HIV and novel approaches to eradicate HIV infection. Dr. Verdin’s laboratory also focuses on a family of proteins—called histone deacetylases—and their role in the aging process and the immune system. 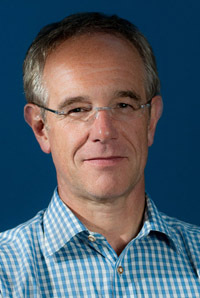 He joined the Gladstone Institute of Virology and Immunology in 1997 and became the associate director in 2004. In November 2016, Eric accepted the position as the President and CEO of the Buck Institute for Research on Aging. Dr. Verdin was elected as a fellow of the American Association for the Advancement of Science and as a member of the American Society for Clinical Investigation and the Association of American Physicians. Dr. Verdin serves on the National Scientific Advisory Council of the American Federation for Aging Research and on the Advisory Council of the National Institute of Drug Abuse at NIH. For his aging research, Dr. Verdin was recognized with a Glenn Award for Research in Biological Mechanisms of Aging and a senior scholarship from the Ellison Medical Foundation. His work on HIV was recognized by an Avant-Garde Award from the National Institutes of Health (NIH). Dr. Verdin has served as reviewer on study sections for the NIH, as the organizer of international meetings and as the editor of several books and reviews. He has published more than 200 international papers and is an inventor on 14 published patents. Che-Ping grew up in a small island – Penang, Malaysia and graduated from Iowa State University with a B.S. degree in Biochemistry. Prior to joining the Verdin lab in 2013 she studied microglia and genetic modifiers of Huntington disease. In addition to managing the Verdin lab, she is currently working on SIRT1 related research. Che-Ping loves animals, especially dogs, and is an avid coffee-holic and foodie. She really enjoys engaging in outdoor activities (especially photography) with her husband. Frenchie working with Eric since October 2012. I earned my Ph.D. at Paris 7- Denis-Diderot. Since then, I have been very busy studying the mechanisms that govern HIV latency in primary cells using the second generation of dual-fluorescence HIV reporter (GKO) I developed in the lab. I am really good at work/life balance, which gives me time to hang out with friends, travel, explore, read, ski, play music.. basically, to enjoy life 😉. I'm interested in using my structural biology skills to better understand mitochondrial protein acylation and its regulation by sirtuins. I finished my PhD in Biochemistry in 2013 at the University of Washington under the mentorship of Roland Strong and William Schief, working on protein design and crystallography to study anti-HIV antibodies. My interest in the biology of aging drew me to the Verdin lab, and I hope to some day continue on to a lab of my own. When time allows, I enjoy rock climbing, live music, exploring the city, and spending time with the amazing friends I've made in California. Cori was born in Washington D.C. and spent most of her childhood on Long Island, New York. She went to the University of Nevada, Reno and received her undergraduate degree in Molecular Microbiology and Immunology with a minor in Biochemistry. She did research and wrote her thesis on an extremely antibiotic resistant form of bacteria called Acinobacter baumanii and their ability to create biofilms that make the infections extremely hard to treat. During college she played lacrosse for the Wolf Pack and coached a local high school girls lacrosse team in Reno as well. After 6 years in Reno she decided it was time for a change and she moved to Petaluma, California. She has worked at Buck since July, 2017 and takes care of the mouse colony and other fundamental laboratory activities. She has 3 dogs and loves to spend her weekends hiking and going to the beach with them along with coaching a travel girls lacrosse team and competing at the post collegiate level on the weekends. Anthony is currently exploring the links between inflammation and aging. He came to the Verdin lab in Spring 2016 after getting his PhD from the Biological Sciences program at the Harvard School of Public Health. He has a particular interest in how the innate immune system utilizes nutrients and came to the Verdin lab because they were among the first to show that endogenous changes in metabolites can affect gene function. His project in the lab is focused on understanding how metabolites impact the innate immune system during aging. Anthony grew up in Los Angeles and got his undergraduate degree in Biochemistry from UCLA. He is glad to be back on the West Coast. He is new to San Francisco and enjoys exploring the city, visiting breweries, and cheering for the Dodgers when they are in town! I grew up in Long Beach, California. I earned my B.S. in Molecular Cell Biology from California State University, Long Beach. In my undergraduate lab, I probed structural aspects of Gα -interacting vesicle-associated protein, a signaling protein which plays a role in regulating cell migration and promoting cell survival. I am currently in the Biology of Aging PhD program between University of Southern California and the Buck Institute for Research on Aging. I joined the Verdin lab in May, 2018. I am interested in the factors that regulate nucleolus size and longevity I enjoy reading, eating at new restaurants and learning new songs on the ukulele. I did my undergraduate work in biology at Duke University, and got my PhD in immunology from UC Berkeley, working on the regulation of cell death in T cell development in the laboratory of Dr. Astar Winoto. Since joining the Verdin lab, my main area of focus has been elucidating the immunobiology of histone deacetylase 7, an epigenetic regulator with an essential role in the maintenance of immune self-tolerance. With other members of the immunology group, I’m working to define the molecular mechanisms whereby the TCR-dependent nuclear export of HDAC7 mediates both negative thymic selection and the differentiation of agonist-selected innate-like T cell populations. By understanding the important role of HDAC7 in T cell development, we hope to gain new insights into the regulation of immune self-tolerance, and also to identify novel molecular pathways that can be targeted in autoimmune disease. When I’m not pushing back the frontier of human knowledge one miniprep at a time, I like to cook fabulous food for my friends and family, hike through the many splendid landscapes surrounding the Bay Area, and play at being a suburban farmer. Yik Lim is originally from Kuala Lumpur, Malaysia. After completing his undergraduate studies at UCSI University, Malaysia, he obtained his Master’s degree from Kyoto University, Japan, and doctorate from the University of Zurich, Switzerland. He joined the Verdin lab in October 2017 and his current research interest centres around understanding HIV infection using high-throughput single-cell technologies. When he is not growing HIV in the lab, he enjoys rolling up and down the hills with Casper, his faithful bike. I joined the Verdin lab in February, 2018, right after my PhD in Chemistry and Chemical Biology from Cornell University, Ithaca, New York. I grew up in Kolkata and Delhi in India, so one can imagine how delighted I am with the Bay Area weather after battling the harsh Ithaca winters! I am interested in applying my analytical chemistry skills to study the regulation of posttranslational acylations of proteins by endogenous metabolites, and their signaling functions. In my spare time, I enjoy trying out new cheesecake recipes, playing with dogs, and discussing Harry Potter and Middle Earth trivia with whoever wants to listen! Tugsan grew up in Izmir, Turkey. He has a B.Sc. on Molecular Biology & Genetics; he got his Ph.D. on Biological Sciences & Bioengineering from Sabanci University, Istanbul. Then, he moved to Italy to work on mitochondrial metabolism in cancer. After a 3-year post-doc training in the National Cancer Institute of Italy, he came to San Francisco to work in Verdin Lab in 2016. He is currently focusing on epigenetic regulation of aging process in model organisms like C. elegans and mouse, as well as cultured mammalian cells. He is investigating the effect of potential compounds that change the activity of histone acetyltransferases and deacetylases. He enjoys singing, cooking and creating molecular gastronomy recipies in his kitchen. Marius grew up in the south of France and received a M.Sc. at the Ecole Polytechnique in Paris. His PhD work at the Institut Curie in Paris focused on transposable element regulation during embryonic development. Marius joined the Verdin lab in September 2016 and has been working on using CRISPR genetic screens to uncover new mechanisms that regulate the establishment of HIV latency. He is also developing new therapeutic strategies against Herpesviruses, and has been particularly interested in Cytomegalovirus. When not in the lab, Marius can be found in various part of California, either climbing, skiing, biking or backpacking. His diet also consists almost exclusively of Avocado, Pringles and Clementines. Ran grew up in Tongling, China. He joined Verdin Lab in September 2017. He has a Bachelor degree in Clinical Medicine; then, he got his PhD in Biochemistry and Molecular Biology from the Chinese Academy of Medical Sciences & Peking Union Medical College. He is currently interested in epigenetic regulation of metabolism and aging. Ran enjoys hiking and cooking.